One of biggest challenges parents face is taking care of a sick child. Specifically, a child with a cough, a cold or both. It’s tough. In fact, the last time my sons were sick, our house was filled with non-stop crying and whining for days. Not from them. From me. Because not only is it difficult to take care of an exhausted, fussy kid, it’s difficult to figure out exactly how to take care of them. Are OTC cough and cold medicines effective? Are cough and cold medicine safe? Just what can you do about the endless coughing? And do natural cures even work? It’s hard to know which advice is best. 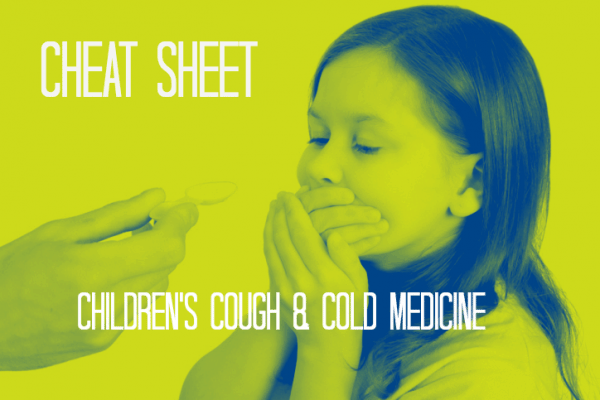 That’s why we’ve put together the following cheat sheet of cough and cold medicine information for parents wondering just how to treat their sick child. Hopefully it’s advice that will not only help your kids feel better, but will help you feel better, too. What Are Children’s Cough And Cold Medicines? Brands that make children’s cough and cold medicine include Mucinex, Robitussin, Dimetap, Advil, Sudafed PE, Pediacare and Delsym. There are also a few natural cough and cold medicine brands like Hyland’s and Zarbees All Natural Children’s Cough Syrup, which uses buckwheat and honey for cough suppression and Zarbee’s nighttime formula, which uses a dark honey blend and melatonin for cough suppression and sleep. What Are the Recommended Ages for Children’s Cough Syrup and Cold Medicine? The main concern about the use of children’s cough and cold medicine is the danger of overdosing or over-medicating via giving your child two over-the-counter medications with the same active ingredient. For example, the acetaminophen you give your child for her fever may also be present in the multi-symptom cold medicine you also give her for her cough. It’s very important to carefully read the directions and the list of ingredients on each medication so you don’t double up on a drug and cause an overdose. It’s also crucial to only use medicine that treats the symptoms your child has. Meaning, don’t give your child multi-symptom cold medicine when they only have a sore throat. It’s better to give too little medicine than too much when dealing with cold and cough and to always watch out for any side effects. Do Children’s Cough and Cold Medicines Even Work? In a word, No. The AAP believes they’re ineffective for kids ages six and under. And while I didn’t find any specific information about their effectiveness in older kids, many pediatricians, including my own, still aren’t big advocates and don’t advise using them at all. That said, some parents I know still give their kids above the age of 10 a dose of cough medicine to help them get a good night’s sleep. They feel that any risk at that age is outweighed by the benefit of rest. I guess I can understand this way of thinking, but it’s not something I feel comfortable doing with my own kids. How Else Should a Cold or Cough Be Treated? Simply put: with time. The majority of doctors say that a cold or cough will just go away by itself. Per WebMD: “No home remedies or cold medicines will make a cold go away faster. A cold usually runs its course in 7 to 10 days.” Of course, that’s not always easy to hear when you’re lying awake listening to your kid cough. Luckily, there are many resources out there detailing the things you can do to make your child more comfortable while they’re sick (including this good one at WebMD), but the perennial advice seems to include fluids, rest, Tylenol for fever (if age appropriate), a nasal aspirator and/or saline solution for stuffy noses and honey for coughing (if age appropriate– no honey before age 1). Chicken soup has even been proven effective at reducing symptoms. All that said, the most important thing a parent can do when their child has a cough or cold is to not overreact. Kids get sick a lot, so be sure to help them maintain good sleep, nutrition and hygiene habits to keep the germs away. And if that doesn’t work, maybe reach for the chicken soup before you reach for the cold and cough medicines. have a 2 1/2 year old and just went through a bout of colds in this family (that still seem to be recirculating itself). we do the humidifier, and putting vicks on the child’s chest, back and then a slather on the bottom of the kid’s feet covered up with socks. i think it helped a lot, she can at least get some much needed rest. A lot of my crunchy-granola friends swear by the cold sock treatment for their kids. We have had MUCH success with giving homeopathic& natural remedies to our 1 year old son. In the winter we boost his Vitamin D intake (put drops in his drinks) and dole out the elderberry syrup at any signs of the flu. For colds, we swear by ColdCalm (made by Boiron). My husband and I use the adults version and it always works (when taken at the very onset of a cold). An ounce of dark chocolate can help with a cough as well. We have also had tremendous success with a combo of semi-natural/homeopathic remedies. I will never go back to Robitissun. last cold season we used children’s Expec, available at Whole Foods, which does contain Guifenesin but not dexteomorthorphan. (trying to recall off the top of my head!) this cold season we used children’s Chestal by Boiron which I’ve foud at CVS, it’s honey based and homeopathic. They suggest no younger than 2 yrs because of the honey, but I did use on my 1 yr old. Kids should not have to put up with a cough for 1-2 weeks unnecessarily. If it’s homeopathic, there’s no risk to your kid because there’s actually no active ingredient in the bottle. You’re giving them a very expensive placebo. Actually, there is a risk when honey is involved due to Clostridium botulinum spores, although I’ve usually read that it’s safe for 1+. You just *really* wouldn’t want to give honey to kids younger than that, and under 6 months is a very bad idea. As for the efficacy, there are actually multiple studies that have shown honey to be effective in cough and sore throat relief. The other ingredients of Chestal I couldn’t tell you anything about, but the honey itself can be helpful and this is borne out by testing. I would definitely not give your son something that you suspect is making him vomit. Perhaps you should call the company to discuss it with them? Usually on every bottle there is contact information, or find it online. Alternatively, contact your son’s doctor or seek medical assistance if necessary.